Artichoke is highly recommended to combat constipation, it is an ideal food to control the appetite because it absorbs the water of the stomach helping people lose weight. It also has a diuretic effect helping against fluid retention. Therefore artichoke is ideal to follow a balanced diet to help you lose weight. 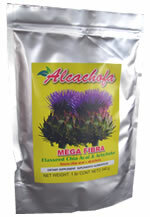 Artichoke helps people to detoxify and eliminate toxins accumulated due to the environment and poor diet. It improves metabolism and acts as a mild laxative which helps to eliminate constipation. What Are The Benefits of Chia? Chia is high in soluble fiber in the form of mucilage which gives a satiety sensation effect to help lose weight. In addition to having a mild laxative effect, it contains antioxidants to protect the body like flavonoids, zinc and manganese. Chia is a food with a high content of omega 3 and omega 6 acids which help increase good cholesterol and eliminate bad cholesterol or LDL. Omega acids help to lower the level of cholesterol in the blood and acts as an anti-inflammatory in the human body. Take ground flaxseed with artichoke in the morning and at night or before going to sleep. Sprinkle onto breakfast cereal, Stir into your oatmeal or yogurt or Stir one or two full tablespoons into a glass of water, fruit juice, or milk.